NAUTICAL NOIR! 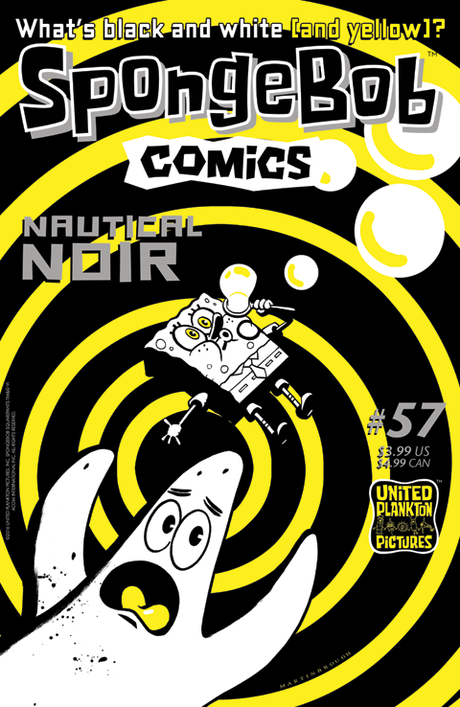 In an issue featuring only the colors black, white, and yellow, Bikini Bottom is revealed as a soggy center of underwater crime, suspense, and paranoia. In “The Wrong Sponge,” SpongeBob is framed for the crime of vase-theft! And only Patrick can save him–so he's sunk. Then in “On the Lam,” meet a thief pursued across the oceans by this one relentless little square guy. And once you read “The Clarinet of Dr. Calamari,” you'll never look at octopi, reed instruments, or German Expressionist cinema the same! Plus: learn why Mermaid Man fears Crime Gully, see Patrick solve a non-crime, and more!